ISTANBUL – Pope Francis was enthusiastically greeted with the ringing of church bells upon arrival at the Ecumenical Patriarchate today on the occasion of the celebration of St. Andrew the Apostle, patron saint of the Church of Constantinople, the Byzantine name for present-day Istanbul. The Pope was received at the patriarchal gate by the Elder Metropolitans of Nicaea and Chalcedon. The Ecumenical Patriarch then escorted the Pope into the Patriarchal Cathedral of St. George. The two leaders followed the Doxology Service, a prayer for thanksgiving and peace, after which they blessed the faithful crowded inside the Patriarchal Cathedral. Also in attendance were the consul generals of Istanbul. 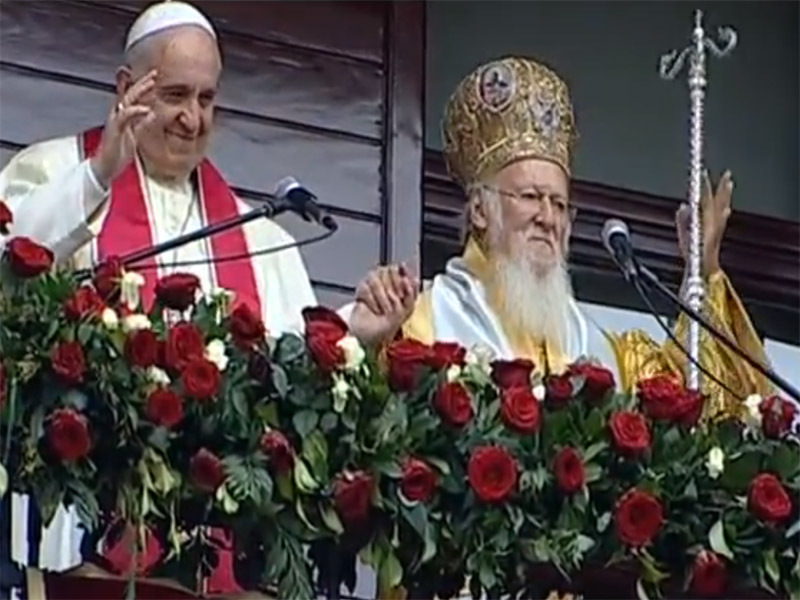 Ecumenical Patriarch Bartholomew presented Pope Francis with an icon of St. George painted on Mt. Athos. In return, Pope Francis offered to His All-Holiness a facsimile copy of an eleventh-century Greek manuscript from the Vatican library and a copy of ninth-century mosaic of Christ from St. Peter’s Basilica. Afterward, the Pope was received in the patriarchal office for a private discussion with His All-Holiness. Before leaving, Pope Francis was introduced the members of the Holy and Sacred Synod. 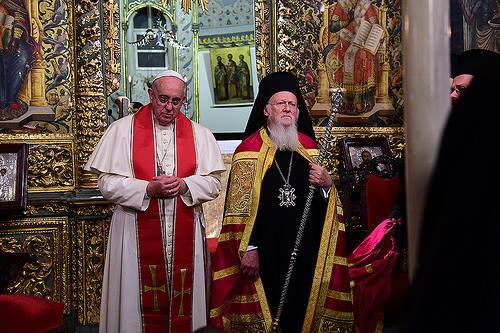 Click here to watch the Video of the Doxology Service for Thanksgiving and Peace at the Patriarchal Church with His Holiness Pope Francis and His All-Holiness Ecumenical Patriarch Bartholomew from November 29, 2014. ISTANBUL – Pope Francis was enthusiastically greeted for a second time upon his arrival at the Ecumenical Patriarchate today, where he attended the Divine Liturgy to commemorate the Feast of St. Andrew the Apostle, the patron saint of the Church of Constantinople, the Byzantine name for present-day Istanbul. The Pope was received by Elder Metropolitan John of Pergamon and the Patriarchal Court, which escorted him to the special guest throne of the Patriarchal Church of St. George. During the service, Ecumenical Patriarch Bartholomew and Pope Francis exchanged the kiss of peace, a symbol of reconciliation and love, and the Lord’s Prayer was read by Pope Francis in Latin. A second plea comes from the victims of the conflicts in so many parts of our world. We hear this resoundingly here, because some neighbouring countries are scarred by an inhumane and brutal war. Taking away the peace of a people, committing every act of violence – or consenting to such acts – especially when directed against the weakest and defenceless, is a profoundly grave sin against God, since it means showing contempt for the image of God which is in man. The cry of the victims of conflict urges us to move with haste along the path of reconciliation and communion between Catholics and Orthodox. Indeed, how can we credibly proclaim the message of peace which comes from Christ, if there continues to be rivalry and disagreement between us (cf. Paul VI, Evangelii Nuntiandi, 77)? Your Holiness, we are already on the way towards full communion and already we can experience eloquent signs of an authentic, albeit incomplete union. This offers us reassurance and encourages us to continue on this journey. We are certain that along this journey we are helped by the intercession of the Apostle Andrew and his brother Peter, held by tradition to be the founders of the Churches of Constantinople and of Rome. We ask God for the great gift of full unity, and the ability to accept it in our lives. Let us never forget to pray for one another.